I love sharing my work, ideas and knowledge with all of you and I know you appreciate it from all your amazing comments and responses I get. But every now and then it's rewarding to get the recognition from someone else. 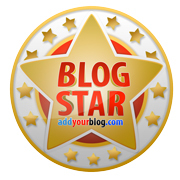 I was very proud and honored to be awarded the Blog Star Award by addyourblog.com. My blog was chosen by their webmasters for the quality of web content, great design and web log everyone loves to read. Thank you very much addyourblog.com! Don't forget to enter the Top 10 Contest! כל הכבוד! מאחלת לך המשך יצירה פוריה וכמובן...שלל פרסים. זה כייף!